Car hire from BEA (British European Airways) in the 1960s. Homepage. This page: Plan ahead with BEA's car hire plan, for passengers flying in their aircraft. 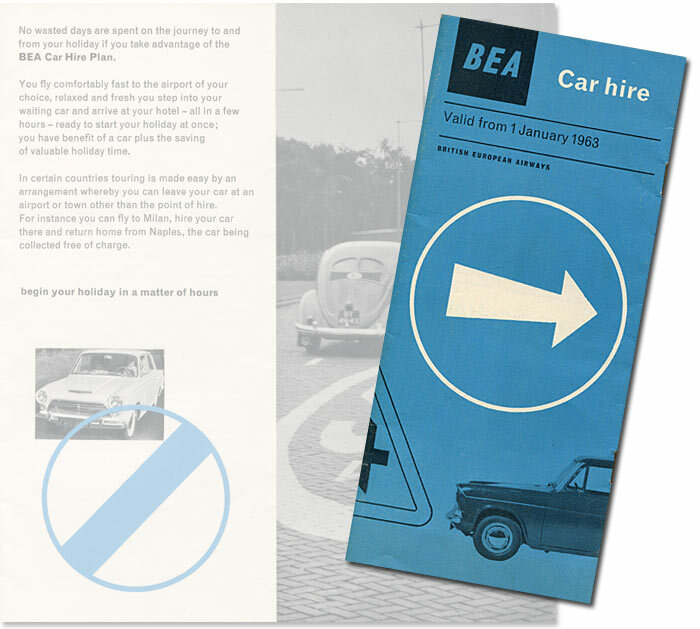 BEA Car Hire Plan 1963. Not only could British European Airways (BEA) arrange flights to destinations the length and breadth of Europe (and beyond), they could also handle Sir or Madam's car hire arrangements. This fold-out catalogue, for the 1963 season, describes the makes and models of car that were available in each country that BEA aircraft flew to. The range of vehicles on offer depended very much on the country being visited, and reflected the types that were common to that country's domestic market. Flyers to any of the German airports for example, could opt for cars such as Volkswagen, Ford Taunus, Opel Kadett & Rekord, Mercedes 190, and for those with the deepest pockets (or most generous employer), a Mercedes 220S automatic, for which a daily charge of £3 1s 0d was charged (assuming it was required for 1-6 days). BEA didn't process the car rentals themselves, rather they had arrangements with approved car hire companies at each destination specified in the catalogue. In Dublin for instance, it was Ryan's Self Drive that handled the bookings (a leaflet for 1963 and 1964 describing their cars in more detail can be found here). Benefits of booking via BEA's Car Hire Plan included the typical requirement for a large deposit paid on collection of the car being waived. British driving licences were acceptable in most countries in which the car hire plan was operating. However visitors to Greece, Ibiza, Israel, Majorca, Morocco and Spain (plus bookings in Czechoslovakia that were to exceed one month) would require an International Driving Permit, the price for which was 10s 6d. They were obtainable from the RAC, the AA, or the RSAC (Royal Scottish Automobile Club). Hirers also had to be aged 21 years or over. Car hire in Great Britain. Travellers hopping onto say a BEA Vickers Viscount for a flight within the UK, had quite a choice of vehicles to pick from. A trip to say Glasgow had vehicles to suit most budgets. Those short of funds could opt for an Austin 7 (ie Mini), for which 17 shillings and sixpence was charged per day, while those with more to spend, or needing more space, may have been tempted by several Fords (Cortina, Classic 315, or Zephyr), a Vauxhall Victor Estate, or for those wishing to tour in style, a Mk9 Jaguar, which would have relieved the hirer of £2 5s 0d each day. Holidaymakers could also choose a Bedford Dormobile Caravan, further details of which will follow. Alas travellers to Birmingham had a less exciting choice. Those watching the pennies could opt for an Austin A40, or push the boat out and pay for a Hillman Minx or Austin A60 Cambridge. The only other option was a 12-seater Austin Omnicoach. Anyone flying to Bristol, Liverpool or Manchester had a much more diverse choice than their Brummie friends, ranging once again from Minis (Austin and Morris versions), via such delights as Ford 105E Anglia, Ford Consul 375, and Hillman Super Minx, to larger cars such as the Zephyr 6, and Austin Princess 3-litre - although the latter wasn't available at Bristol, presumably down to the particular rental firm operating in the area not using these machines. Visitors to the Isle of Man could only opt for a Morris, so any thoughts of brand loyalty from die-hard Austin, Hillman, or Vauxhall owners had to remain at the airport. All of Cowley's popular models are listed, ranging from 848cc Minis, through to Minors, 1100s and Oxfords. On the subject of Oxfords, 1962-year cars were cheaper than brand new 1963-year examples - £1 17s 6d as opposed to £2 5s 0d. Mods and rockers may have preferred two-wheeled transportation, in which case they could put their name down for a DKW Hobby two-seat scooter. 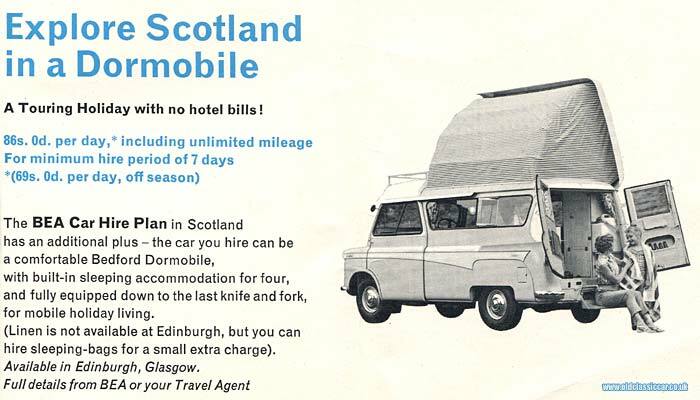 Tour Scotland in a Dormobile. Built-in accommodation for four persons and the freedom to roam the bylanes of Scotland were offered by the Bedford Dormobile option, the camper version of the trusty Bedford CA van. Two young fillies are shown beaming broadly at each other while perched in the rear entrance of their Bedford, a vehicle equipped "down to the last knife and fork" for fun times in the countryside. Car options at other destinations. There are few surprises when looking at the range of cars offered at destinations outside of the UK. Sweden for example, fields an assortment of Opels, VWs and Fords, joined understandably by home-grown SAABs (96 saloon and 95 estate) and Volvos (Amazon saloon, estate, and also the P1800). Americans could feel right at home by hiring either a 3.6 litre Dodge Lancer, or a 4.2 litre Ford Galaxie, while large groups could choose either a Ford or VW 8-seater minibus. The cars on offer in Israel are a mixed bunch. Europeans would perhaps have felt most comfortable with the Ford Taunus 12M and 17M, while visitors from the States could pick either a Studebaker Lark, or one of two variations of Chevrolet Belair. One I'd not heard of before is the Susita Anglia (997cc), which it would appear was a home-grown car produced using 105E Anglia components under a fibreglass estate-car body, by Autocars Co. Ltd of Haifa, Israel. £3 19s 0d was required for each day of the Susita's hire. Flyers disembarking from a BEA Vickers Vanguards at, say, Malta for instance, had no such curious offerings to choose from. Old favourites such as the Minor, 100E Prefect, Consul and a French favourite in the shape of the Peugeot 203, could be assured of reliable, dependable transportation around the island. Likewise, jet-setters heading off to sunny destinations such as Athens in the airline's swish Comet 4Bs, were faced with a similar range of dependable motors to those found in Malta, something of a come-down perhaps after the excitement of flying in by jet from Heathrow. The only hint of four-wheeled excitement might come courtesy of the only convertible listed, a 948cc MG Midget. Other stand-out cars on offer are a Skoda Octavia, Volga, and a Tatra (all in Czechoslovakia), Borgward Isabella (Austria), Citroen ID19 (Corsica), six-seater Pontiac Parisienne (London, Heathrow & Gatwick), Humber Hawk (Irish Republic), and DKW Jr (Portugal). A photograph that features a BEA Viscount in a c1960 livery can be found on the E83W van page.